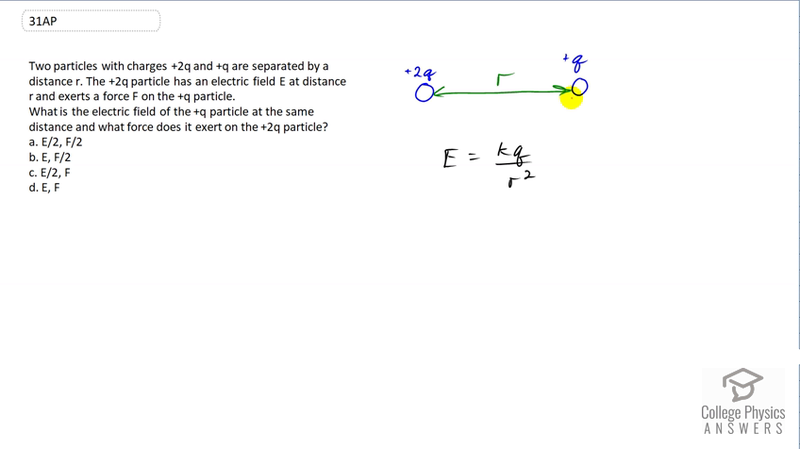 Two particles with charges +2q and +q are separated by a distance r. The +2q particle has an electric field E at distance r and exerts a force F on the +q particle. What is the electric field of the +q particle at the same distance and what force does it exert on the +2q particle? This is College Physics Answer with Shaun Dychko. In this question we're told that there are two charges separated by a distance r and this charge, plus two q, exerts some force F on the plus q charge. The question is what force does the plus q exert on the two plus q charge? Well this is the force on charge two due to charge one, and Newton's Third Law says that there must be an equal magnitude but opposite direction force exerted by the second object on the first. So this is the force on object one due to object two. The forces have to be the same. So that narrow our possibilities down to either C or D. Now, this charge is half the magnitude of this charge and so the electric field caused by charge two at the position of charge one will be half of the electric field due to charge one at the position of charge two. So the answer is going to be C.